Old Dutch 161/2"x121/2"x18" Oval Antique Copper Chafing Dish, 6 Qt - Offered in both polished and antiqued copper finishes, these impressive chaffers feature stainless steel food liners in 3, 6 and 8 quart sizes suitable for gatherings large and small. 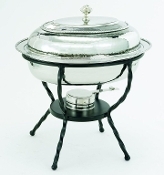 Old Dutch 21"x16"x19" Rect Antique Copper Chafing Dish, 8 Qt Offered in both polished and antiqued copper finishes, these impressive chaffers feature stainless steel food liners in 3, 6 and 8 quart sizes suitable for gatherings large and small. Old Dutch 161/2"x121/2"x18" Oval Décor Copper Chafing Dish, 6 Qt For serving pieces worthy of a royal buffet, look no further than Old Dutch's 'De La Cuisine' collection of elegant chafing dishes. 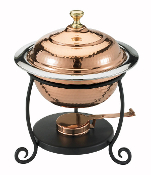 Old Dutch 21"x16"x19" Rect Décor Copper Chafing Dish, 8 Qt For serving pieces worthy of a royal buffet, look no further than Old Dutch's 'De La Cuisine' collection of elegant chafing dishes. Healthy, nutritious desserts can be just minutes away with the Orka Fruit Cooker. Place whole fruit inside the premium silicone holder, cover, and place in the oven or microwave; fruit cooks in its own juices. For serving pieces worthy of a royal buffet, look no further than Old Dutch's 'De La Cuisine' collection of elegant chafing dishes. 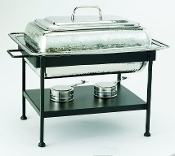 21" x 15½" x 18" Rectangular Stainless Steel Chafing Dish, 8 Quarts. For serving pieces worthy of a royal buffet, look no further than Old Dutch's 'De La Cuisine' collection of elegant chafing dishes. 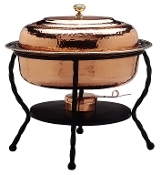 Old Dutch 838 Round Antique Copper Chafing Dish, 1-3/4-Quart, 10 by 12-1/4-Inch For trend setting serve ware worthy of the finest table look no further than this elegant chafing dish. 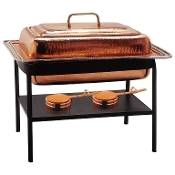 the rich, hand-hammered antique copper finish and black iron stand elevate your gourmet fare to a new level. 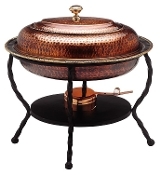 Old Dutch 12" x 15" Round Antique Copper Chafing Dish, 3 Qt Offered in both polished and antiqued copper finishes, these impressive chaffers feature stainless steel food liners in 3, 6 and 8 quart sizes suitable for gatherings large and small. Cuisinox Elite® 11 piece Cookware Set is the same set as the 10 pc, but with a steamer insert for steaming vegetables. Always a perfect start for those who deserve a little extra. Cuisinox Elite® 5 piece Cookware Set also known as the "condo set". This compact 5 pc set was designed for the young single chef living in his/her new condo with a moderate kitchenette. Cuisinox Elite® 7 piece Cookware Set is the perfect start. 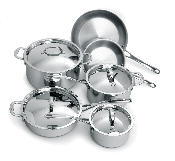 You will certainly be adding on to this collection after you have started cooking with this cookware set. Cuisinox Gourmet® 10 pc Cookware Set with same two-toned satin and mirror finish 18/10 stainless steel exterior gives this cookware a very European look. Cuisinox Gourmet® 7pc Cookware Set with same two-toned satin and mirror finish 18/10 stainless steel exterior gives this cookware a very European look.